Dr Bike is NCA’s qualified cycle mechanic who is available to visit workplaces, schools, community centres or events to help get neglected bikes back on the road. Our mechanic will check over bikes and make simple repairs and adjustments to ensure they are in good working order. If a bike needs serious work we will arrange to repair your bike at our workshop facility – but simple repairs like fixing punctures, tuning gears, fitting new brake blocks and replacing cables we will undertake on the spot for no extra charge. We can typically look at 3 or 4 bikes per hour, meaning a standard 4-hour surgery can get up to 16 bikes back into use. 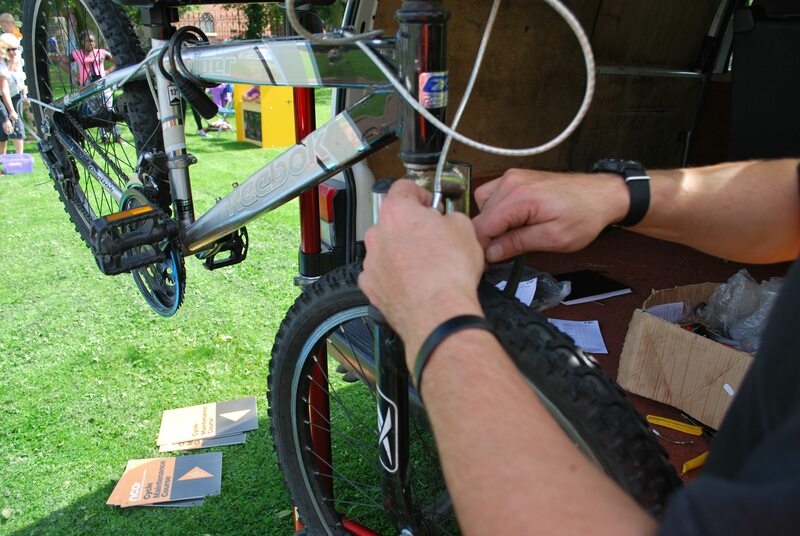 We can also run Dr Bike Surgeries with more than one mechanic – just let us know when booking. DO YOU WANT DR BIKE TO COME AND RUN A SURGERY FOR YOU?